The accordion is a very important instrument in various Mexican musical genres, especially in norteño music in the northern region of Mexico. Exactly who first brought the accordion to Mexico still remains a point of contention. But it is generally agreed that German settlers in the Rio Grande Valley introduced the instrument to the region in the mid-19th century, on both sides of the river in Southern Texas and Northern Mexico. German immigrants came to Texas around the mid-1800s and settled in Central Texas in towns like Fredericksburg, Gruene, and New Braunfels–better known as the German Belt. Bringing their language, culture and musical traditions, they made contact with the Mexican Americans. In Texas, there were several substantial waves of German immigration. The first, when Friedrich Ernst, “Father of German Immigration to Texas,” arrived in Texas in 1831 and received a grant of more than 4,000 acres in what is now Austin County. He set about encouraging other Germans to join him. This tract of land formed the nucleus of what is now known as the German Belt. The next wave came in 1842, when a group of German nobles formed the Society for the Protection of German Immigrants in Texas, also called Adelsverein. Their intention was to create a new German fatherland in America where German workers could prosper, and which would open new markets for industry and commerce in Germany. Between 1844 and 1847 more than 7,000 Germans reached Texas and founded towns such as New Braunfels and Fredericksburg. Eventually, lured by work on railroad lines, among other work opportunities, the immigrants moved farther south to South Texas and Northern Mexico, and they brought with them the accordion and their tradition of waltzes and polkas. By 1890, the accordion was fairly common in Mexican groups in the Texas-Mexico border region. Nice footage of Narciso Martinez, Flaco Jiminez, etc. Narciso Martinez has been called the “father” of the modern conjunto for promoting the accordion and the bajo sexto and for his creativity as an accordionist. Searching for a way to stamp his personal style on the accordion, in the 1930’s Martinez abandoned the old, Germanic technique by virtually avoiding the bass-chord buttons on his two-row accordion, concentrating instead on the right hand, treble melody buttons. His sound was instantly distinctive and recognizable. Its brighter, snappier, and cleaner tone contrasted with the older sound, in which bajo sexto and the accordionist’s left hand both played bass-and accompaniment, creating a “thicker,” drone-like effect. Martinez left bassing and chordal accompaniment to the bajo sexto of his most capable partner, Santiago Almeida. Narciso Martinez’s new style became the hallmark of the surging conjunto, just as Almeida’s brisk execution on the bajo sexto created the standard for future bajistas. Together, the two had given birth to the modern conjunto, a musical style that would challenge even the formidable mariachi in cultural breadth and depth of public acceptance. Indeed, by the 1970s it could be said that the conjunto, known in the larger market as musica nortena, was the most powerful musical symbol of working-class culture. The whole thing started when the late professor Guillermo Hernandez found out that I had this enormous Mexican record collection and most of it is from material recorded really on our border in San Antonio and El Paso and during the heyday of the early recording business in the late twenties and early thirties. That’s when so much of the most interesting corridos, which are narrative ballads that are generally true stories, were recorded about every kind of subject along the border. I said, “Guillermo, you’re in the same state as the most famous conjunta, that means group, Los Tigres del Norte, and they live in San Jose. They are million sellers, as big as the Rolling Stones are in the gringo world. So he had them come over and play for his corrido concert and they got along really good. I think the leader of the Tigres realized that this institution is recognizing their music as cultural material that should be preserved and studied and analyzed and so on. All of a sudden here were professors who were spending time researching these stories and finding out why they are singing these songs that are dealing with the daily problems of people, like immigration. So they agreed and their record label Fonovisa decided to get together with the Tigres and they gave $500,000 to UCLA as a gift to, first of all, digitize all of my 78 Mexican stuff. There are roughly 17,000 78s, so that’s two sides per record so that means 34,000 songs or tunes or whatever. So their money helped us get started. The corrido in its usual form is a ballad of eight-syllable, four-line stanzas sung to a simple tune in fast waltz time, now often in polka rhythm. Corridos have traditionally been men’s songs. They have been sung at home, on horseback, in town plazas by traveling troubadours, in cantinas by blind guitarreros (guitarists), on campaigns during the Mexican Revolution (1910–30), and on migrant workers’ journeys north to the fields. Now they are heard frequently on recordings and over the radio. These ballads are generally in major keys and have tunes with a short—less than an octave—range. Américo Paredes, the preeminent scholar of the corrido of the lower Rio Grande border area, remarked: “The short range allows the corrido to be sung at the top of the singer’s voice, an essential part of the corrido style.” In Texas this singing has traditionally been accompanied by a guitar or bajo sexto, a type of twelve-string guitar popular in Texas and northern Mexico. In its literary form the corrido seems to be a direct descendent of the romance, a Spanish ballad form that developed in the Middle Ages, became a traditional form, and was brought to the New World by Spanish conquistadors. Like the romance, the corrido employs a four-line stanza form with an abcd rhyme pattern. Paredes surmised that corrido is ultimately derived from the Andalusian phrase romance corrido, which denoted a refrainless, rapidly sung romance. With the noun dropped, the participle corrido, from a verb meaning “to run,” itself became a noun. The corrido, like the romance, relates a story or event of local or national interest—a hero’s deeds, a bandit’s exploits, a barroom shootout, or a natural disaster, for instance. It has long been observed, however, that songs with little or no narration are still called corridos if they adhere to the corrido’s usual literary and musical form. 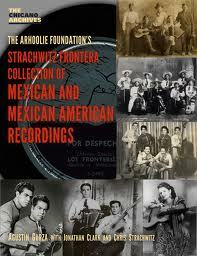 The Strachwitz Frontera Collection of Mexican and Mexican American Recordings contains over 140,000 individual recordings on 78, 45, LP and cassette, over 2,000 photographs, posters, catalogs and other images, and a database of record company histories, musicians’ biographies and much more. It is without contest the largest collection of its kind on the planet. Enter Agustin Gurza, the first writer to take a shot at wrestling this monster to the ground. 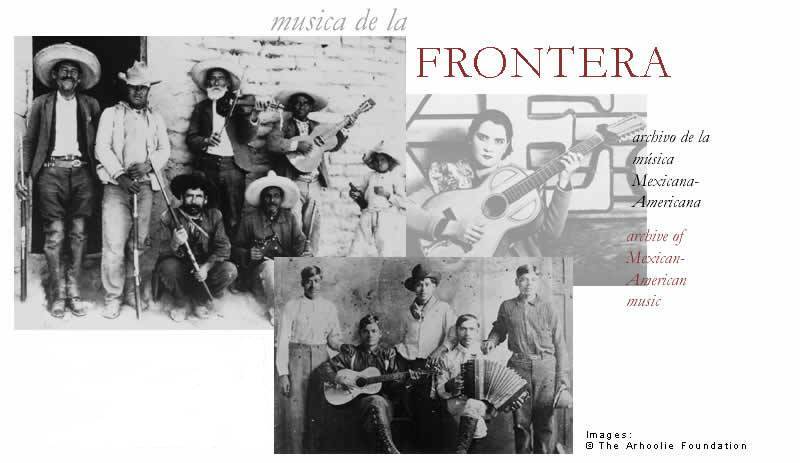 His introduction and guide to the Frontera Collection (pictured above), recently published by the UCLA Chicano Studies Research Center, offers a manageable look at a seemingly endless resource. His approach is to explore the Frontera Collection from different viewpoints, discussing genre, theme, and some of the thousands of composers and performers whose work is contained in the archive. Throughout, he examines the cultural significance of the recordings and relates the stories of those who have had a vital role in their production and preservation. An essay by Chris Strachwitz traces the history of commercial recordings of Mexican music, and another by historian and mariachero Jonathan Clark tells the story of mariachi from its earliest days to the present. Also included are playlists of favorites chosen by Strachwitz and by the man who has personally digitized over 70,000 of these recordings, musician and Arhoolie Foundation Head Digitizing Technician Antonio Cuellar. It’s probably hard for us to believe it, but as little as two generations ago the accordion was basically unheard of in Mexican-American music. If it was heard, it would be in the bordellos, accompanying sordid noon-time “dollar-a-dance” soirees, or in the rough cantinas on the fringe of town where the respectable folk wouldn’t be caught dead. 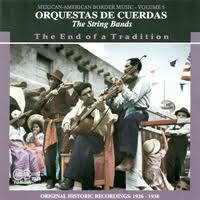 Proper entertainment was provided by the string based Orquestas Tipicas, playing a wide variety of popular and folk tunes. It wasn’t until the rise of radio and the estimable talents of accordionists like Narcisco Martinez and Bruno Villareal that the accordion shed it’s “gutter” image. Today, however, the only sound of fiddles in the plaza in San Antonio is from the modern Mariachi. Though they may appear similar from the outside, they were in fact quite different, as this collection shows. Over The Waves (Sobre Las Olas) is probably the best known waltz in the South and Southwest, and in tejano music. Though sometimes thought to be a Strauss waltz, “Over the Waves” was the best-known work of Juventino Rosas (1868-1894), a pure-blooded Otomi Indian from Mexico. Rosas grew up playing violin in his father’s wandering string band in Mexico City, and by the time he was 15 he was good enough to take a job with a touring opera company. After a miserable stint in the army, he returned to Mexico City to try to eke out a living writing drawing room pieces for a local publishing company. “Over the Waves,” by the Kessinger Bros.